Creative Explorations, Inspirations, and Studio Practices. The desired configuration of stone and bronze. The Idea: I want to mount a bronze casting to a chunk of stone that is bolted to a live-edge maple base with a 4mm brass spacer holding the stone up off the surface of the base so that there is a nice floating edge detail. 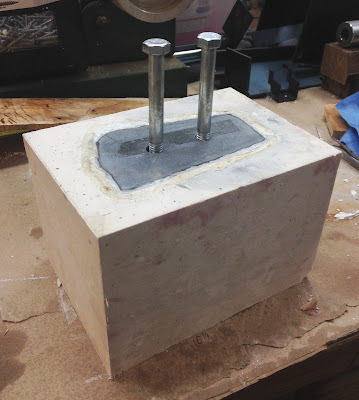 I will drill 4 holes into the top surface of the stone to epoxy threaded rods in place that will slide up the inside corners of the hollow bronze casting and be affixed with PC-7 epoxy. I will need to cut out the brass spacer first, and use that as a template to drill 2 holes perpendicular to the bottom of the stone to epoxy in threaded rods that will go through clearance holes in the wood base and be secured with acorn nuts from below. 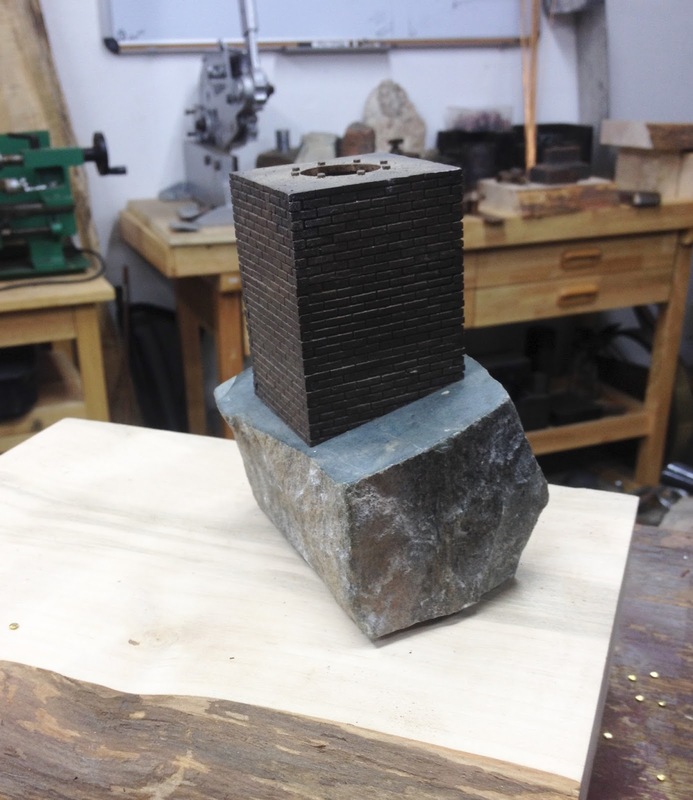 The Problem: The 2 flat-ground faces of the stone are not parallel, meaning that I can only drill holes that are perpendicular to the surface opposite what I am drilling into, as it is the surface resting on the drill press table. Clamping the stone is not an option, as the force needed to secure it from vibrating loose while using a diamond hole saw bit would likely damage the texture on the stone and potentially destroy it. Gluing the stone to a board that is bolted or clamped to the drill press bed is also an equally risky option, as the stone could pop off the board while drilling and result in a potentially dangerous situation. 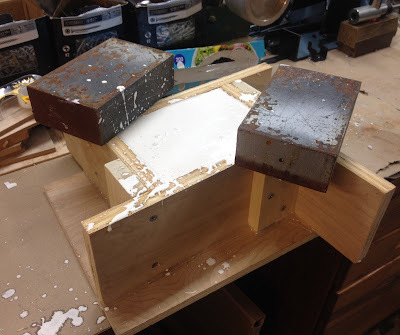 The Solution: Encase the stone in a plaster mold that will hold the stone steady without damaging it and drill the necessary holes in the bottom surface that is now parallel to the top of the plaster mold and the drill-press bed. 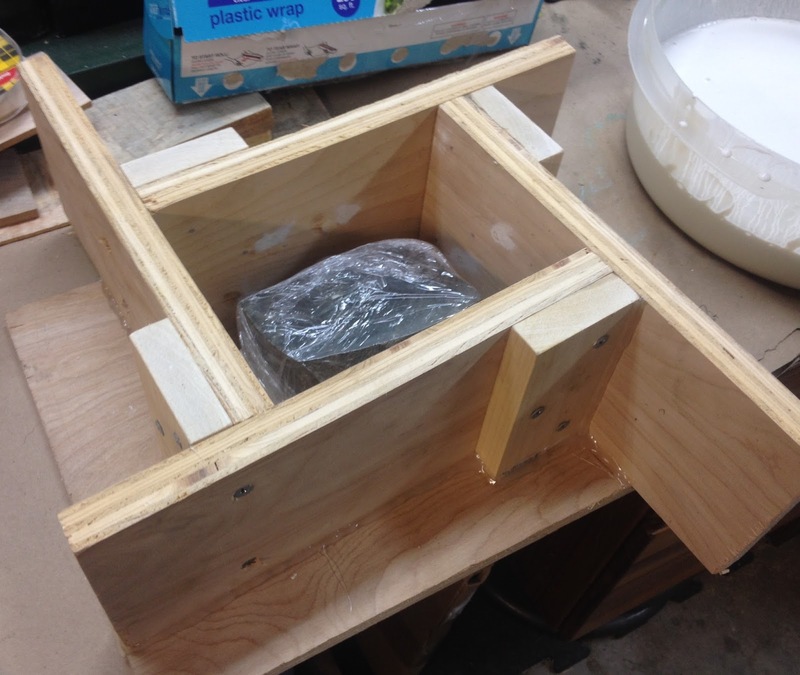 The stone wrapped and mounted inside the mold frame, with all joints sealed with hot-glue. The plaster mold poured with steel weights on top to prevent a blowout from the bottom seam. 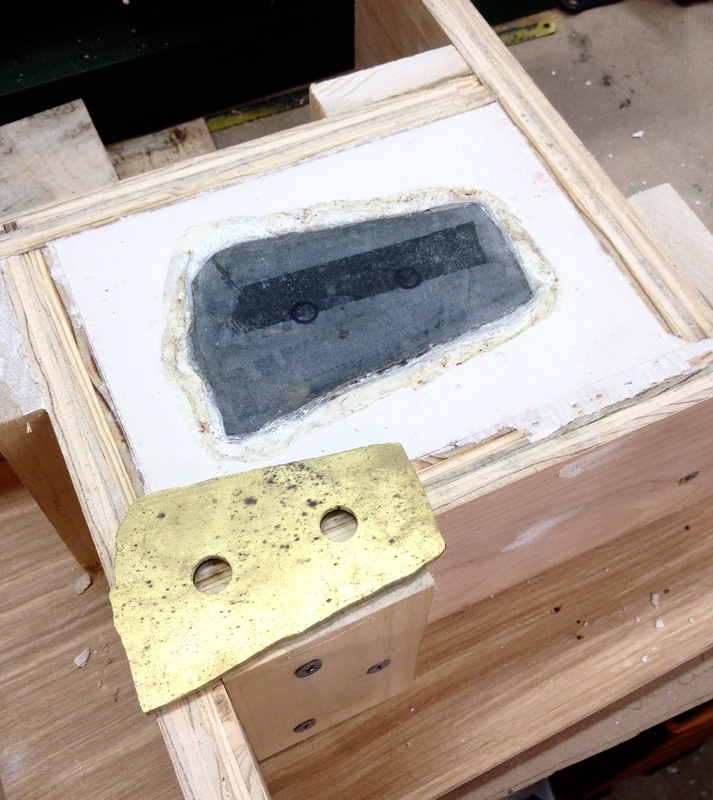 The mold base removed and the stone marked for drilling with the brass pre-drilled spacer. Wet-drilling the 11mm holes in the stone with a diamond core drill bit and water. The holes drilled successfully and mold frame removed, ready to break open the plaster. This blog is a documentation of my artwork, inspirations, and creative process as I navigate the complexities of post-MFA life and the real world as an artist, maker, and designer. My mission is to reignite my studio practice and creative production while at the same time working as a full-time bench jeweler and goldsmith with a heavy focus on repair work and antique and estate jewelry, and reconnect and collaborate with colleagues, classmates, and the metalsmithing community.